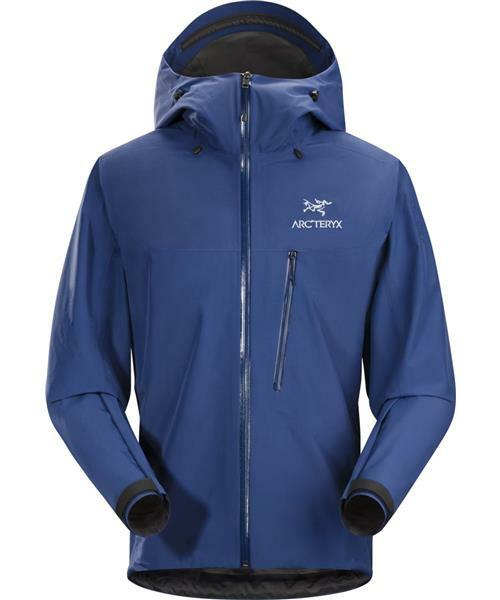 * Design, materials and build combine to make this the lightest alpine compatible Arc'teryx waterproof shell. The use of e3D patterning technology helps create a jacket that uses minimal materials to create a trim fit with enhanced freedom to move. * N40r Gore-Tex® fabric with Paclite® technology is one of the lightest waterproof/breathable fabric Arc'teryx uses. Highly packable, it features a mini-ripstop face for increased tear strength and an exceptional DWR treatment for a high level of initial water repellency. * Innovative construction and patterning work with lightweight materials to shed grams. The 1.6 mm micro-seam allowance reduces weight and bulk, as does the use of 13 mm Gore® seam tape. Even the zipper pulls use an ultralight cord. * An ultralight shell that is all about minimizing weight and bulk without sacrificing advanced performance. It is thoughtfully designed emergency storm protection for fast and light alpine climbing, and works in tandem with the Alpha SL Pant to deliver the confidence to perform even in highly adverse weather conditions. Alpha SL Jacket - Mens is rated 4.6 out of 5 by 20. Rated 5 out of 5 by Marc from Excellent Jacket For Any Outdoor adventure I attend an adventure tourism program and this is my go to jacket for any of our electives. Whether it be as just a rain shell I pack for a rock climbing or Trekking expedition or as my outer layer for Ice Climbing and snowboarding, this jacket does it all. Super light weight and packs very small which helps for long treks into the back country, very durable for the paclite shell and withstands anything the weather can throw at you! I would recommend this jacket to anyone who does any sort of outdoor activity. Even if the weather looks nice, throw it into the bottom of your pack and you wont even know its there until you need it! Rated 5 out of 5 by Ricky36 from Excellent design and minimalist features... I am very impressed with my Alpha SL Jacket and have no real negative comments..This is my second Alpha SL (my first was one from 2005),which had just one chest pocket...and having used and abused it(still waterproof)my Dad is now the proud owner!! Hence i got hold of a new one.. I really like having the two hand pockets which will easily take a map, hat and gloves etc...The fit is athletic and trim with room for some under layers. My main use for this Jacket is an all-round performance shell which lives in the pack whilst at the Crag and comes out when the rain starts(very common in the English lake District! ),for hill walking, scrambling and summer alpine use.. IMO one of the better Paclite shells on the market.. Rated 5 out of 5 by Balthazar from Well made and exactly as advertised I love this jacket, beacuse it delivers exactly what it promises to deliver. I would like to use this review to explain this, and to address two big issues I have with a lot of these seemingly confused reviews going around. Nothing about this jacket should surprise anyone. Here's why: First: It's a Paclite jacket. Obviously it's not as durable and/or breathable as Pro or Active. But it's cheaper and its lighter, and it delivers exactly the same wind- and rain protection. If anyone says a Pro is more rainproof, they're wrong. Pro is more durable (construction mainly) and breathable, and Active is more breathable and (perhaps) slightly more durable (construction). However, this jacket does sport a 40 denier face fabric (although not the super-tough N40p-x, like the Alpha FL), and as such, it is a pretty burly Paclite jacket. For the same reason, it's not the lightest on the market. But for a 40 denier face fabric jacket, it probably is. Second: It might not have pit zips, and it only has one pocket, but this should be very clear just by looking at it. If you know you want pit zips or more pockets, buy a jacket, that has those features. Just know that it will be heavier, and it will cost more. Because, you know, pit zips and pockets weigh more than just fabric, and putting them in takes time and therefore costs money. Complaining that a jacket, you bought, has no pit zips, is like bying a sportscar and complain that you can't fit your entire family in the backseat. Obviously, the car is not therefore flawed, you purchased the wrong car. Like I said, I love this jacket. It is easily light enough to earn its place in my pack on every outdoor occasion, and I have no worries pulling it on for rough use. If you want a lighter jacket, look elsewhere, but be prepared for something like 10-15 denier and much less durability. If you want more versatility (read: durability and breathability), go for the Alpha FL, which weighs only 20 grams more. It does cost 50% more, but I think it's a bargain. I don't feel like I need more durability, but I also don't want a lot less, so for me, this is a great choice. I'm sure I would love the FL too. And for the five stars: It's quite simply beautifully made, for what it is, and Arc'teryx are very up-front about what it is. There should be no surprises with this one, only expected satisfaction. Rated 4 out of 5 by prospect151 from Love the jacket Great jacket. Small, compact, lightweight, great waterproofing. Appreciate the little travel sack that it comes with. Only complaint is that I wish it had armpit vents. Also it fits me very well. Rated 5 out of 5 by provotrout from Versatile, WP shell with durable fabric This is my winter/summer/spring/fall rain/waterproof shell. Don't need anything more. It's durable, blocks wind and moisture, has excellent adjustability and layers well with softshells, hardfleece, parkas, etc. It's the perfect wp/b piece, not so heavy you question packing it yet functional enough to get you safely through ugly situations. And oh yeah, the fabric withstands scrub oak bushwhacking and bouncing around off rock. Rated 5 out of 5 by albertanewf from great shell jacket I purchased this Jacket in late February. Living in Northern Alberta, Canada I purchased this jack for two reasons. 1. As a outer layer shell to wear in winter on top of a fleece jacket. 2. As an easily packable lightweight waterproof jacket to take on hikes. So far so good as an outer shell. I've worn it in -20 Celcius temps with a simple fleece jacket under and have been warm and toasty. Does a great job blocking the bitter cold wind we get here as well as the snow. I've yet to test in any rainy conditions and will update my review accordingly once i do. Rated 5 out of 5 by AmbientPhoto from All time favorite alpine shell As an ultra-light hiker/climbing, I always seek out products that deliver superior performance with the least weight and smallest packable size possible. The Alpha SL does just this. The Alpha SL packs down to a very small roll, even with the numerous useful zippers (which usually stiffen jackets up and make them less packable). The SL really excels in contrast to other shells thanks to the with the pit-zips. Even as a breathable shell, open pit-zips allow for keeping the jacket on, the wind out, and the moisture/perspiration venting when conditions are just enough in flux you don't want to take the jacket off. I've worn this is sleet and rain storms and the GoreText Pac-Lite has performed superbly. The cut is athletic and fits fine, especially when layering, but might feel a bit roomy in the chest area for thinner individuals (myself included).